Paulownia is one of the most important commercial trees in China. It is indigenous to China, and later being introduced into Europe, North America and Australia. High fire resistance: High ignition point about 400 deg C with average softwood 257 deg C and average hardwood 223 deg C.
Strength: one of the highest strength to weight ratios of any wood, with strength modus of rupture MOR (psi) of Paulownia of 5740. Rot resistance: naturally high resistant to rot. Workability: fine-grained, soft, mostly knot free, very consistent, holds nails and screws well and no pilot holes needed, can be cut with a saw without splitting easily. Attractiveness: light blond appearance, stains well and can be made to mimic other woods. Paulownia trees are extremely fast growing, and can be harvested in 8~15 years for valuable timber. This tree can be intercropped with food crops resulting in increased yields, used for windbreaks, shelterbelts, soil erosion abatements, reclamation, ornamental plantings, and honey. A full-grown Paulownia can reach a height of 30 to 60 feet, and grow up to 8 feet in one year under ideal conditions. This tree is well-suited for agroforestry systems because of its deep tap root. It does not compete with shallow rooted crops. The roots condition the soil and retain moisture. The large leaves can be used as fodder. A 10-year-old tree can produce 30 kg of dry leaves annually, and 400 kg of young branches. The leaves also serve as a valuable soil amendment; they break down slowly, providing a slower release of minerals to the soil than small leaves. 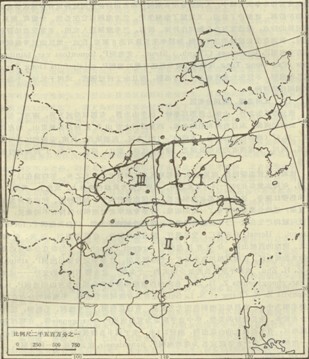 Paulownia naturally and manually distributed over 20 provinces in China. There are about 1 billion stands and 80 million cubic meters of standing wood store. The paulownia is main planted in the plain area of yellow river , huai river, and hai river, especially in Henan, Shandong, Anhui, and Jiangsu four provinces. According to statistics, there are 0.4 billion stands and 43 million cubic meters of standing tree store in these four provinces. In the northeast semi-drought river beds and loess plateau, there are 0.2 billion stands.The plantation and utilization of paulownia have glorious future. Nailing - Paulownia can be nailed by hand or air-actuated tool. Bearing in mind Paulownia is a relatively soft timber and therefore requires lower pressures to effect the desired penetration. 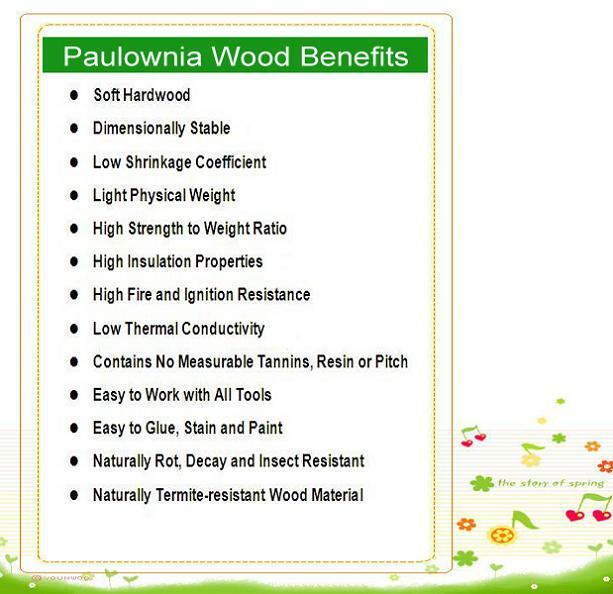 Paulownia has a low tendency to split and is best used in conjunction with an adhesive. Screwing - Hand and power driven screws are suitable for use with Paulownia provided that adequate attention is given to the settings, so as not to overdrive the screw and reduce the holding ability of the thread. Good results can be obtained by observing these constraints particularly when using power - drive screws. The uniformity of grain in Paulownia gives more consistent results with minimal splitting. Gluing - Paulownia has been tested with five different brands of PVA, Cross-linked PVA and Urea Formaldehyde adhesives. Samples were prepared with each type of adhesive and Standard Separation tests conducted. Manufacturers recommendations were observed for each adhesive. 100% of the tested samples passed i.e. they did not separate along the glue line. AlI gave excellent results with minimal clamping time. Comparative tests between Paulownia and other hardwoods all showed the superiority of Paulownia timber with respect to fast cure time and uniform glue time. In all cases, using PVA adhesives on Paulownia halved the average time required for clamping. The time and cost saving in a board jointing production run is obvious. Sanding - Paulownia is easy to sand. A smooth finish can be achieved using minimal effort. Sanding materials generally last much longer with Paulownia than other hardwoods. A fine finish is achieved in much less time. There is a very low resin content in Paulownia, which results in longer sandpaper life and less clogging of belts and pad sanders. Machining - Paulownia is easy to saw, plane, mould, turn and carve. Low silica content results in longer life of all tool edges when working with Paulownia. AII facets of power machining of this timber should give good results. Staining and Finishing - Paulownia accepts paints and stains well. Oil and spirit stains are easily applied and give excellent results. A suitable sanding sealer is recommended before the application of clear finishes. Opaque finishes adhere readily. Light sanding between coats is recommended. Lining Boards - Paulownia boards are suitable for lining in all interior walls and ceiling situations including bathrooms and saunas. They can be fixed vertically, horizontally and diagonally. Lining boards can be supplied dressed so that they can be sealed with a moisture excluding coating. Lining boards should be supported at a maximum of 600mm spacings. In kitchen and bathroom areas it is recommended that Paulownia be sealed on both sides before fixing. Two to three coats of a polyurethane clear resin will give good protection of exposed surfaces. Doors and Windows - The lightness and relative strength of Paulownia makes it an ideal timber for exposed joinery such as external doors and windows. Tests have shown that Paulownia, in its natural state, has an outdoor durability rating comparable to Western Red Cedar. To preserve the natural appearance of Paulownia some form of proprietary coating should be applied. Exterior Cladding - The natural durability of Paulownia lends itself to exterior cladding applications either in its natural blond coloured state or colour matched to suit the environment. It is recommended that an appropriate water-repellent sealant be applied (minimum two coats) before fixing. Where heavy exposure may be encountered Paulownia responds well to light organic solvent (LOSP) type preservatives, increasing outdoor life by preventing the onset of decay. Paulownia trees are believed to bring Good Fortune . Paulownia tree is usually being related with phoenix. Phoenix is the king of birds , and phoenix only land on paulownia trees... bring prosperity and wisdom . Traditionally ,when Japanese couples have a daughter ,they plant a Paulownia Tree .When the daughter is ready to marry ,they cut down the tree and make a dowry chest ,furniture and other items out of it for wedding gifts.